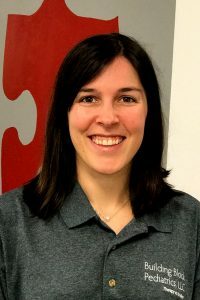 Sally is a certified Speech-Language Pathologist who earned her degree in Communication and Sciences Disorders from Auburn University and her Masters of Education in Communication Disorders from Valdosta State University. She is certified nationally through the American Speech Language Association (ASHA) as well as holding her Georgia State License. Sally’s aspirations to become a Speech Language Pathologist started when she was just six years old when she would join her younger brother in his speech therapy sessions. Her mom explained that Sally was the only one who could relate what he was trying to say to everyone around him. Sally has worked in several locations including outpatient adult rehabilitation, the public school system in Fulton County, and a pediatric clinic in Columbus, Georgia housed in Easter Seals of West Georgia. Sally has experience serving children ages 3 months to 18 years old and their families with different types of disorders, delays, and medical backgrounds. Examples include: genetic disorders, Autism, Apraxia of Speech, oral motor and feeding difficulties, articulation/phonological disorders, expressive and receptive language delays/disorders, down syndrome, delays/disorders in Pragmatic (social skills), and Fluency (stuttering). When she is not working, Sally enjoys spending time with her husband, her dog Penny, and her friends. She enjoys reading, cooking, taking Penny on walks, and cheering on the Auburn Tigers and the Georgia Tech Yellow Jackets!